One of the first things that guests and visitors see when walking up to a house is its front door. That door gives them an idea about what they can expect inside. A door that is large and imposing with sidelights might bring to mind an instant picture of a classic home filled with antiques. Something simpler and more basic in a bright and cheerful color might make visitors imagine a home filled with laughter and kids. It's not surprising that the first thing many people do when they buy a home is change the front door. That simple change provides an instant facelift to the home. Doors come in a variety of unique styles and are made from many different materials including wood and metal. Some love the look of a classic, solid core wood door. Decorative panels engraved or pressed into the front add some texture and keep it from looking like all the other doors on the block. These designs come in styles with just one panel on the front or multiple panels. Those who want to let in more natural light might prefer designs with windows or glass lights on the front. Those lights add a more decorative look and bring in more light. Others want to combine all the benefits of new doors and windows with a design that features a transom and/or sidelights. Sidelights are tall, thin pieces of glass that sit on one or both sides of the door and come in clear or colored glass designs. A transom is a small window that sits directly above the door. Like sidelights, transoms come in designs made from clear glass or colored glass. 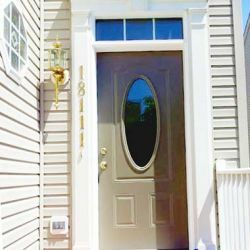 Some homeowners may also want to install a storm door to protect against cold temperatures and high winds or security doors that offer some protection from threats outside the home. Seneca Creek Home Improvement offers a no-blame lifetime warranty on all doors that it installs. That warranty covers all types of damage and repairs, no matter who is at fault. Whether installing protective security doors or a decorative entrance door with sidelights, Seneca Creek Home Improvement offers services for all homeowners. A vent is any type of opening on a roof that serves to release some of the air found inside the building. Vents usually have some type of closure that blocks out debris and animals. FAQ answered by roofing contractors Seneca Creek Home Improvement: What are the best shingles for a roof? The best shingles for a home depend on the look and style the owners want. Natural stone is among the most expensive roof materials, but stone can last for decades. Asphalt and composition shingles are durable and more affordable. Contractors work with homeowners to determine which materials and colors are best for the home.